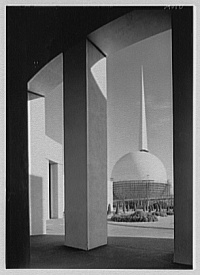 The Trylon and Perisphere were two modernistic structures, together known as the "Theme Center," at the center of the New York World's Fair of 1939-1940. Connected to the 610 foot spire-shaped Trylon by what was at the time the world's longest escalator, the Perisphere was a tremendous sphere, 180 feet in diameter. The sphere housed a diorama called "Democracity" which, in keeping with the fair's theme "The World of Tomorrow", depicted a utopian city-of-the-future. Democracity was viewed from above on a moving sidewalk, while a multi-image slide presentation was projected on the interior surface of the sphere. After exiting the Perisphere, visitors descended to ground level on the third element of the Theme Center, the Helicline, a 950 foot-long spiral ramp that partially encircled the Perisphere. The Trylon and Perisphere became the central symbol of the 1939 World's Fair, its image reproduced by the million on a wide range of promotional materials and serving as the fairground's focal point. The United States issued a postage stamp in 1939 depicting the Trylon and Perisphere (pictured). Neither structure survives; however, the Unisphere is now located where the Perisphere once stood. The Theme Center was designed by architects Wallace Harrison and J. Andre Fouilhoux, with the interior exhibit by Henry Dreyfuss. The structures were built in Flushing Meadows Park in Queens, New York and were intended as temporary with steel framing and plaster board facades. Both buildings were subsequently razed and scrapped after the closing of the fair, their materials to be used in World War II armaments. The word Perisphere was coined using the Greek prefix peri-, meaning all around, about, or enclosing, surrounding. The word Trylon was coined from the phrase "triangular pylon". Composer (and Rhapsody in Blue orchestrator) Ferde Grofe was commissioned by the World's Fair to compose a piece of symphonic music dedicated to the sculptured edifices. The Trylon is mentioned in the 1939 Yip Harburg song "Lydia the Tattooed Lady", made famous by Groucho Marx. In the 1942 WB cartoon "Crazy Cruise", the Trylon and Perisphere are jokingly presented as being part of the pyramids of Egypt. An episode of The Twilight Zone featured a view of these structures from the air. A photo of visitors on the walkway between the two structures is used as the cover art of the 2000 album Deltron 3030. In the 2004 movie Sky Captain and the World of Tomorrow, the two structures are briefly seen in an arctic region. Cohen, Barbara. Trylon and Perisphere. Harry N. Abrams, Inc. Publishers, New York, 1989. Gelernter, David. 1939: The Lost World of the Fair. The Free Press, New York, 1995. Newhouse, Victoria. Wallace K. Harrision, Architect. Rezzoli International Publications Inc. New York, 1989. "New York World's Fair, 1939." Architectural Forum, June 1939. vol. 70, pp. 393-462. "The World's Fair will put on a 6-minute show inside its perisphere." Life, Aug. 1938. pp. 55-58. "Aerodynamics of the Perisphere and Trylon at World's Fair." American Society of Civil Engineers, Vol. 65 Issue 5, 1938. pp.887-906. Unless indicated otherwise, the text in this article is either based on Wikipedia article "Trylon and Perisphere" or another language Wikipedia page thereof used under the terms of the GNU Free Documentation License; or on original research by Jahsonic and friends. See Art and Popular Culture's copyright notice. This page was last modified 14:14, 3 April 2013.